Reading glasses are no fun for anyone. Most of us experience the need for near vision glasses once we reach our early to mid 40’s. Some of us go to our Optometrist and are sold very expensive readers, sometimes costing in excess of $300. Others go to the nearest chemist and buy off the shelf readers for $10. Neither option is wrong. If the $10 readers do pretty much the same job and allow you to see your phone, favourite book or ingredients on the back of a box clearly… then why wouldn’t you choose this option! The name for this unwelcome phenomenon is Presbyopia, which literally means ‘old eye’. These age-related changes occur within the proteins in the lens, making the lens harder and less elastic over time. Age-related changes also take place in the muscle fibres surrounding the lens. With less elasticity, the eye has a harder time focusing up close. Presbyopia affects nearly 1.7 billion people worldwide, and that number is expected to grow to 2.1 billion by the year 2020. For this reason, presbyopia correcting surgery is a big market and Ophthalmologists are still trying to find the perfect answer to this age old annoying problem. Kamra Inlays by AcuFocus have been sold and cleared for use in the EU since 2010 and marketed in a total of 33 countries although did not receive FDA approval in the USA until June 2014. The inlay sits within the stromal bed (stroma-shown left) which is one of the layers within the cornea. Smaller and thinner than a contact lens, the inlay is a mini-ring with an opening – or pinhole – in the centre. This pinhole allows only focused light to enter your eye. Your non-KAMRA eye is left untouched. It is only suitable for patients that have very good uncorrected distance vision, otherwise, LASIK is available to correct that persons distance vision before undergoing the corneal implant. 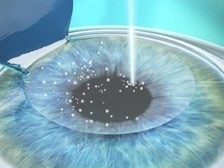 The procedure is done by using a laser to create a small pocket within the cornea and then inserting the KAMRA inlay. The idea behind inserting this tiny lens into the cornea is to create a pinhole effect for patients, minimising the amount of light entering the eye and allowing the patient to focus on objects up close such as their mobile phone, tablet, book, newspaper etc. It is supposed to work on the same principle as a small camera aperture by increasing the depth of focus. The opening in the inlay allows only focused light into the eye, allowing you to see near, far and everything in-between. There seems to be an average of 80% success using this particular method of presbyopia correction but nothing set in stone as far as ‘success rates’ go. The KAMRA inlay procedure may not eliminate the need for reading glasses. 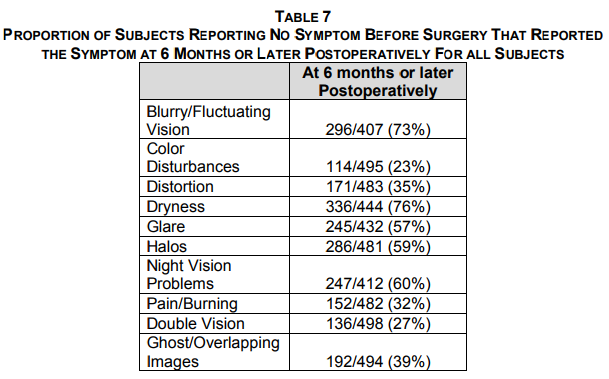 The KAMRA inlay procedure may cause blurred vision, difficulties with contrast sensitivity, problems with night vision, double vision, ghost images, glare, halos, and color disturbances. Your eye may also feel pain, dryness, burning, discomfort and look red. Non-surgical alternatives to the KAMRA inlay procedure include the use of reading glasses or contact lenses. 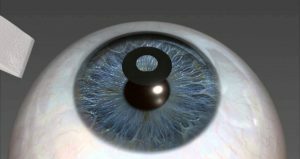 Before considering the KAMRA inlay procedure you should: 1) Have a complete eye examination and, 2) Talk with your eye surgeon about the alternatives to treatment, potential benefits, complications, risks, and time required for healing. 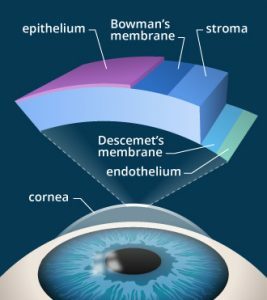 Monovision LASIK / PRK (laser eye surgery options) – Monovision means using your dominant eye for distance vision which may or may not require laser correction depending on your pre-operative measurements and your less dominant eye for near vision. This option is fantastic but it is not permanent. Presbyopia worsens with age and therefore, your near vision will continue to deteriorate following your procedure. Your doctor cannot predict the rate of deterioration you will experience and can therefore, not guarantee how long you will experience improved reading vision before heading back down the reading glasses road! Monovision RLE / Trifocal RLE (refractive lens exchange) – This is a more permanent monovision correction and involves replacing the natural clear lens inside of your eye with an artificial intraocular lens (IOL). RLE is a great alternative to laser eye surgery for those over 40 as it can offer a more permanent near vision result as well as great distance vision. By replacing the natural lens, you will never suffer with cataracts or the visual deterioration caused by cataracts. 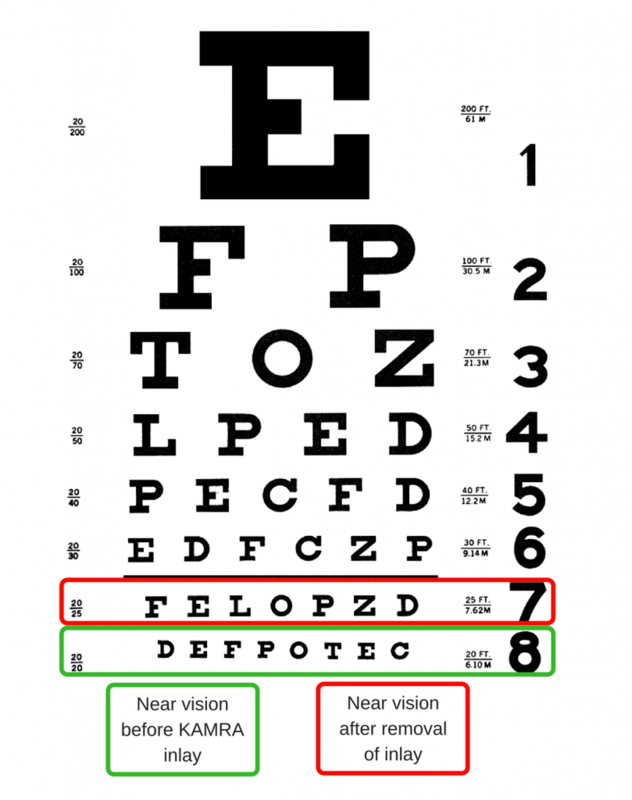 You also have the option of trifocals if monovision is not a suitable option for you (20% of patients’ brains are unable to cope with the difference in vision in the eyes). Whatever option you decide suits you best, always ensure you are fully informed first. With each elective procedure comes risk of complications during surgery or post-operatively. A reputable Ophthalmologist will ensure you are fully informed of all possible outcomes and risks and advise you of the likelihood of you experiencing them are. Happy hunting for your readers free future.